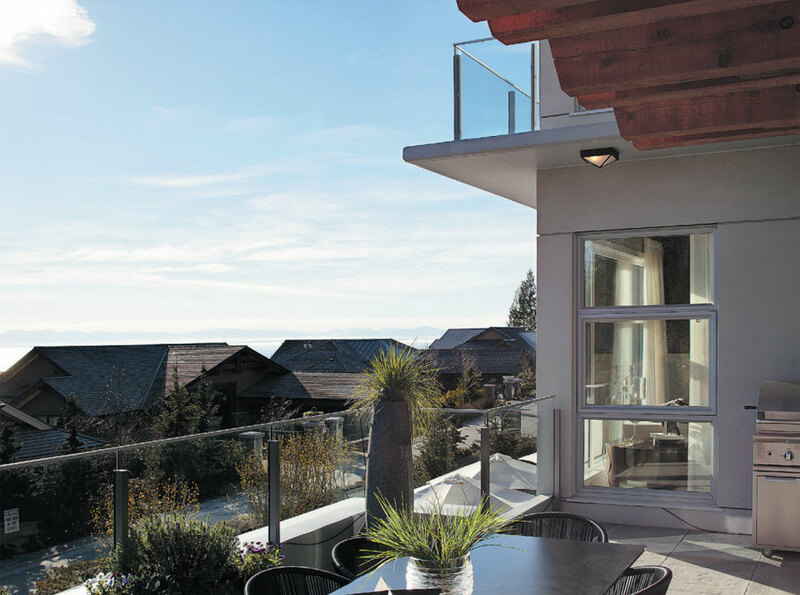 British Pacific Properties, stretched out across West Vancouver’s mountainside above the Upper Levels Highway, has been renowned for decades for its remarkable views of Vancouver’s downtown skyline and westside. Aston Hill, the company’s lat- est multi-family development on its 4,000 acres of land holdings, takes those views to a whole new level, with a lot of work by the planners and architects to meet the demanding building stan- dards set by West Vancouver council. The 20 strata duplex homes are built into the hillside along winding switchbacks with grades up to 30 per cent, requiring the architects to abandon conven- tional residential construction techniques and literally invent a new style of architecture to fit the terrain. The result is that the homes have low-pitched cedar-clad roofs and large overhangs don’t obscure the city views from other homes staggered up the hillside behind and appear to naturally grow out of the hilly landscape, Huggins said. He said it has also led to yet another genre of local design — West Coast Modern — an evolution that builds on the work of such architects as Arthur Erickson, Fred Holling- sworth and Ron Thom and the West Coast Contemporary style that succeeded them. The show home’s entry and reception level has an over-sized two-car garage and a Japanese-inspired water feature at the front door that opens to a foyer with heated stone tile. To one side of the entrance is a large den, while straight ahead a millwork archway marks the entrance to the galleria. A bathroom and laundry room are off one side of the galleria. The middle level features open-concept living with the kitchen against the back wall with an offset layout lead-ing to a family room, a dining room and then a living room with a contemporary linear gas fireplace framed in marble and exotic wood finishings. All areas look out to the spectacular view and a large sliding glass door opening onto a 325-square foot terrace. The level also has a powder room. The kitchen is fitted in oakwood cabinetry, custom stained to match the hardwood floor. Homes come with a Sub Zero 36-inch integrated fridge and freezer with internal water and ice dispensers and a custom panel to match the hardwood cabinetry. Contrasting with the wood are glossy upper cabinets with a granite backsplash. On the top level are an expansive master bedroom and a “retreat” sitting area, walk-in closet and balcony. Lighting controls for the entire home are contained in iPads, which are fitted into wall niches for easy access both at home and from outside by the Internet.Two other bedrooms share a second bathroom. One bedroom has a walk-in closet and a smaller-sized terrace, while the second smaller bedroom has a large window view without a terrace. The master ensuite designed with an exotic wood veneer vanity topped with a granite countertop, in-floor heating, an obscured glass toilet room enclosure, and a low-profile drain system leading to a frameless shower area, convenient for those in a wheelchair. The entire area is fitted in stonewall and floor tile. “I loved the view and it’s quiet and really close to the trails.” She also liked plans by British Pacific Properties to develop a commercial area for residents living above Highway.